The percentage of American adults with a college degree grew 0.7 percent from 2011 to 2012, according to a report on college attainment released on Tuesday by the Lumina Foundation. That small increase means the nation is already behind on the foundation’s goal of 60-percent attainment by 2025. 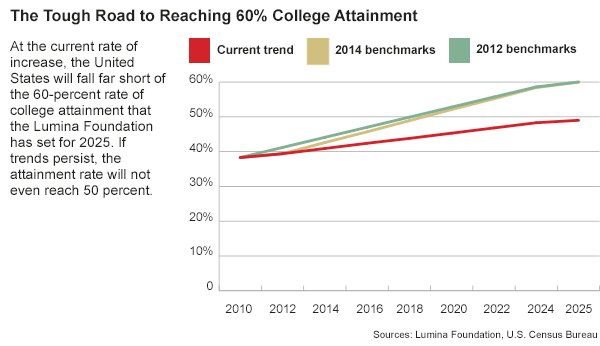 This is Lumina’s fifth annual report, titled “A Stronger Nation Through Higher Education,” to include national and state-by-state figures on college attainment. The report says 39.4 percent of U.S. residents age 25 to 64 held some form of postsecondary education credential in 2012. While this year’s report shows an improvement from the previous year, the figure is nearly two percentage points less than what the foundation plotted as a benchmark for this point two years ago. The report and Lumina’s leadership are focusing largely on the improvements, while cautioning that greater increases are unlikely without “significant changes in higher education” to help underserved Hispanic and African-American students earn college degrees. “This is the largest year-over-year increase in degree attainment since Lumina began these reports,” the foundation says in its explanation of the figures, noting that the previous annual increases were less than one-half of a percentage point. The report also notes that increases in the college-attainment rates of young adults age 25 to 34, now at nearly 41 percent—three percentage points higher than in 2008—are a positive indicator of future attainment rates. But a number of issues make future progress more difficult, he said, including a drop in college enrollment accompanying the economic recovery and a declining population of high-school students over all. “We have to focus on adults because it is hard to conceive of a way to get to the goal just by focusing on traditional students,” he said. The biggest challenge, however, is that higher education has to do a better job of educating the nation’s underserved minority students, as well as low-income and first-generation students, Mr. Merisotis said. In particular, he said, colleges must improve completion rates among Hispanic and African-American students, who graduate at much lower rates than do their white and Asian-American peers. Among the adult population of the United States, nearly 44 percent of whites and more than 59 percent of Asian-Americans have a college degree, according to Census Bureau figures cited in the Lumina report. That compares with less than 28 percent of black adults and about 20 percent of Hispanic adults, the report says. While college enrollment by underserved minority students is improving, the college-attainment rate could actually decline, to less than 38 percent by 2025, if the completion rates for those groups do not improve, the report says.